Star Trek: Discovery has made waves in Europe, coming up top rated across all seven of the countries reviewed in our pre-MIPCOM In-demand special, after launching in the US on CBS All Access and Netflix elsewhere in September. As the first series developed specifically for CBS’s SVOD service, the new Star Trek has gained CBS record sign-ups for its SVOD service. 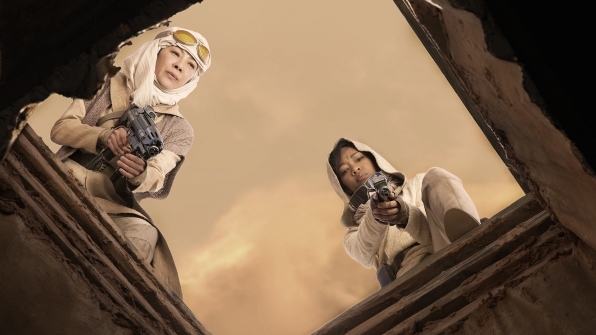 It’s the first Star Trek iteration to appear since Star Trek: Enterprise concluded in 2015. Other shows recurring in the top three across nations included Narcos and Stranger Things. The third season of Narcos was launched throughout Europe in September and Stranger Things is set to start its second series in October. 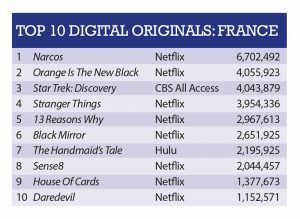 France’s top three digital original favourites include Narcos, Orange is the New Black (OITNB) and Star Trek: Discovery. The third season of Narcos produced 65% more demand than the second favourite OITNB. Also appearing on the digital favourites are 13 Reasons Why, House of Cards and Sense8, which have steady week-on-week demand despite having been released months earlier. Sense8 still draws high demand among some countries despite being cancelled earlier in the year. Unsurprisingly, in the top ten overall shows, Game of Thrones led the list followed by The Walking Dead and Grey’s Anatomy. The latter, a Shonda Rhimes-created show, has just started its 14th season and appears in a range of the top ten lists across the seven countries. Following the top three on the overalls list are fan favourites such as Pretty Little Liars, Narcos and The Big Bang Theory. 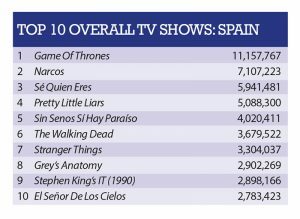 Spanish originals are popular in the country, appearing in both the digital originals and overalls list. Club De Cuervos and Las Chicas del Cable appear third and sixth in the digitals list. 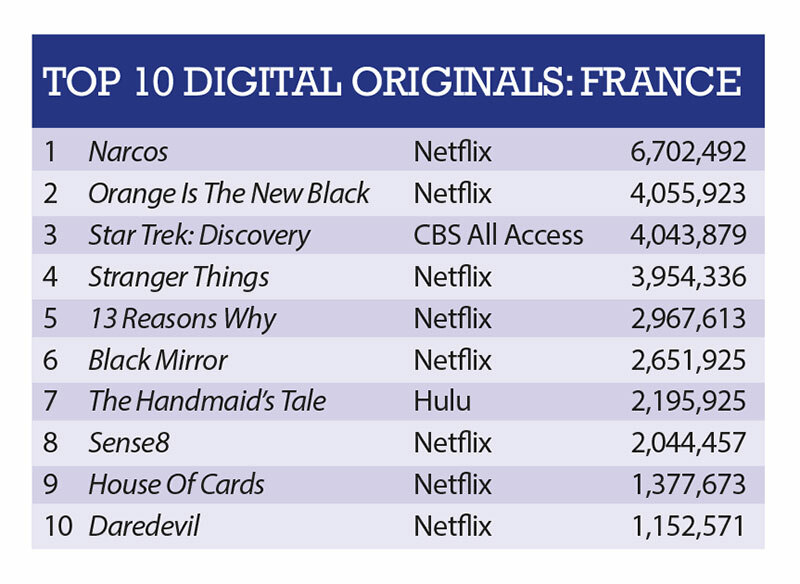 Narcos leads as a digital favourite with Stranger Things appearing second. Other regular favourites appear on the list including OITNB, Black Mirror, 13 Reasons Why and Sense8. 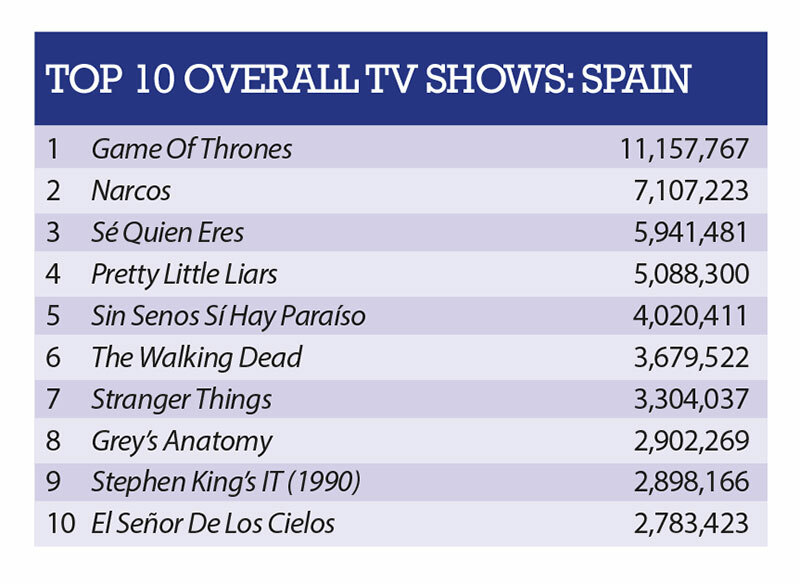 On the overalls list, Spanish originals Sé Quien Eres, Sin Senos sí Hay Paraíso and El Señor de los Cielos appear in third, fifth and tenth spot, respectively. Sé Quien Eres (also known as I Know Who You Are) has been popular since its January 2017 Telecinco release. Also on the overalls list, Narcos, Pretty Little Liars and Grey’s Anatomy make an appearance. In addition, Stephen King’s IT (1990) makes a resurgence after its recent remake. 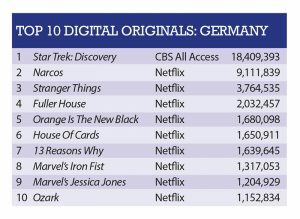 Star Trek: Discovery dominated both the digital and overalls list in Germany, just beating GOT, an unusual turn. On the digital list, Marvel shows Iron Fist and Jessica Jones also performed well in the region coming eighth and ninth on the list preceded by Stranger Things, Fuller House and OITNB. Following Star Trek on the overalls list, Stephen King’s IT (1990), Narcos and The Walking Dead also performed well. German original Köln 50667 came in ninth. 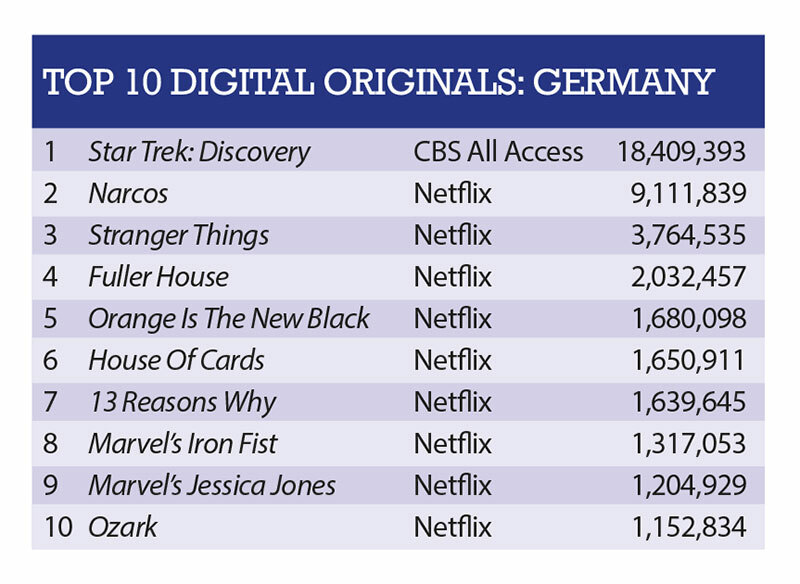 Germany’s overalls list also featured The Walking Dead’s companion series Fear The Walking Dead in tenth place, showing high demand for the Robert Kirkman and Dave Erickson series. 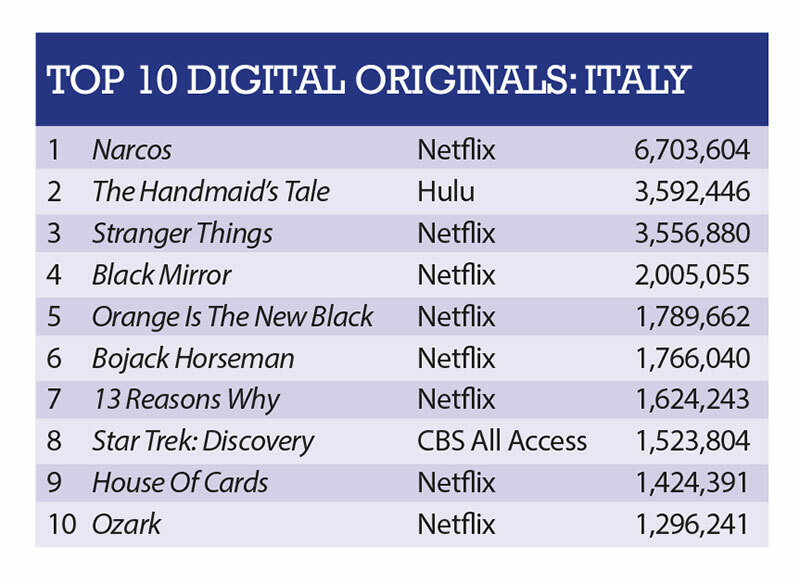 The Handmaid’s Tale remains popular in Italy, coming in second on the digtal’s list preceded only by Narcos. The region has some other surprising favourites compared to the other nations’ featuring Bojack Horseman and Ozark in its top list in sixth and tenth place. 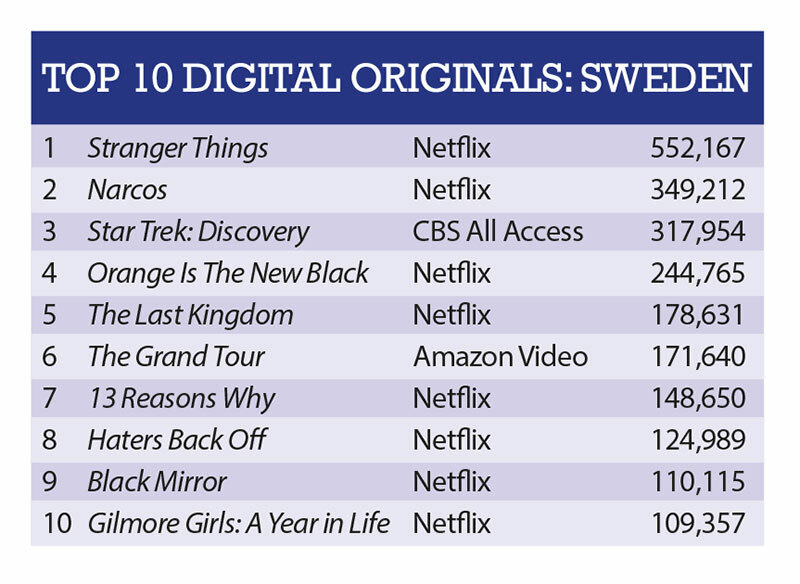 Black Mirror has made an appearance in quite a few of the countries top ten digital list, in this case taking the fourth spot. Stranger Things, OITNB, Star Trek and House of Cards took the remaining spots in third, fifth, eighth and ninth place. 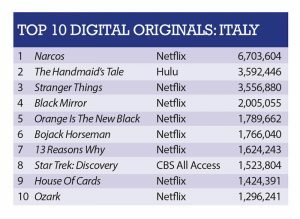 In its overall list, Italy featured favourites GoT, Grey’s Anatomy and Narcos. The newest season of Grey’s has increased its demand significantly in Italy, generating 87% more demand than AMC’s The Walking Dead, which comes seventh on the list. Coming in fifth on the list is Gomorrah, the Italian crime original. 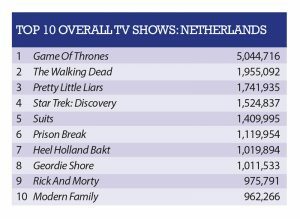 Unsurprisingly, The Grand Tour featured fifth in the Netherlands top digital list. Earlier this week, Parrot Analytics revealed that the show was most in-demand in Europe beating Netflix’s 13 Reasons Why, OITNB and House of Cards to the top spot between January 1 and August 31. Haters Back Off and Fuller House also appeared on the list, coming in eighth and tenth. These series have been less popular in the other featured countries. The overall list features favourites such as GOT and Pretty Little Liars, but also older favourites such as Prison Break, Suits, Geordie Shore and Modern Family. British Bakeoff remake Heel Holland Bakt came in seventh on the list, remaining a top watched show. Swedish originals ranked highly on the overalls list with Gåsmamman coming in second and Solsidan coming in fourth. 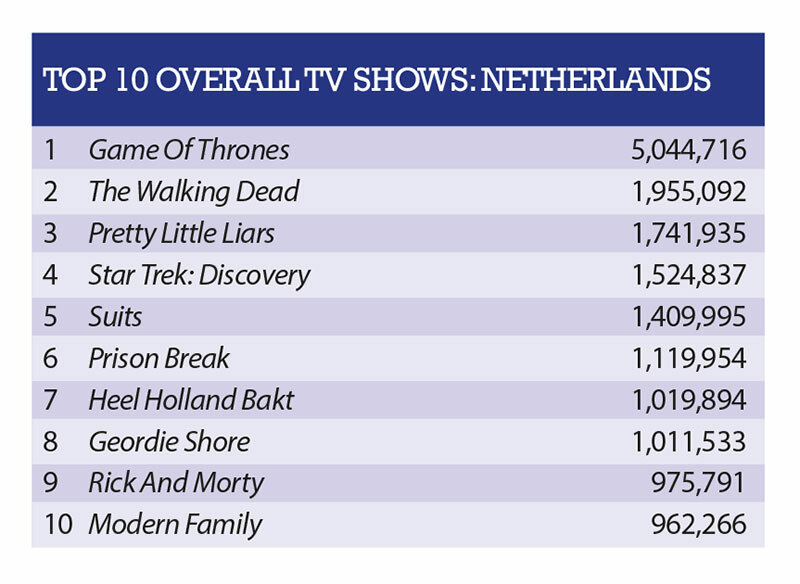 The list is led by GOT and also features toons Rick and Morty and South Park in seventh and ninth spot, respectively. For the digitals list, Gilmore Girls: A Year in Life makes a surprise appearance in tenth place months after its release last November. The three top series are Stranger Things, Narcos and Star Trek: Discovery. 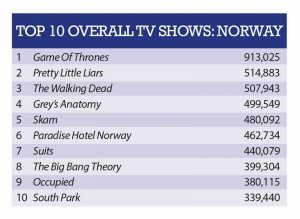 Also in the list are The Grand Tour, Haters Back Off and The Last Kingdom, which has only appeared among the lists once and in this region. Last Kingdom ranked highly coming in fifth on the list. 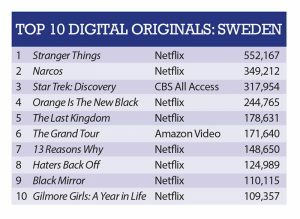 Norway’s digital favourites feature a mixed bag ranging from common hits such as Stranger Things, The Grand Tour and Narcos in the top three to older shows Lilyhammer, The Crown and Yahoo! Screen’s Community in seventh, ninth and tenth place. 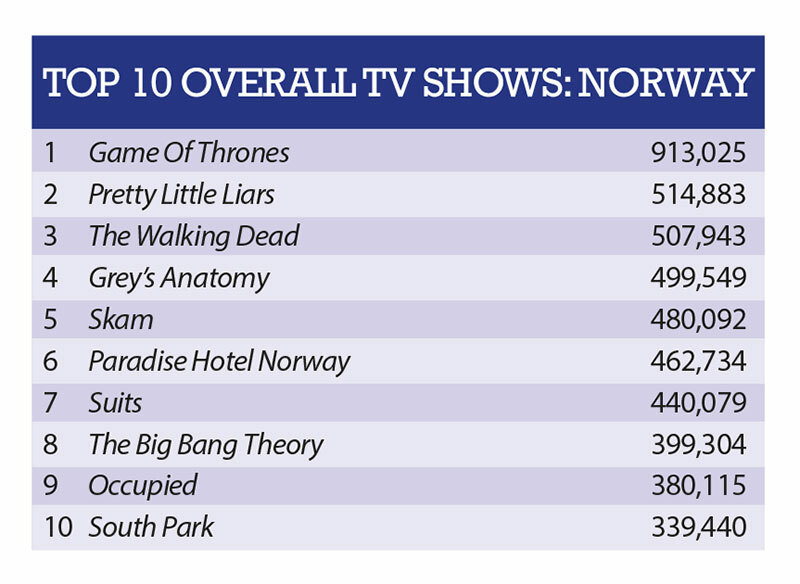 Norwegian originals feature heavily in its overalls list with Skam, Paradise Hotel Norway and Okkupert (Occupied) coming in fifth, sixth and ninth place respectively. GOT led the list with Pretty Little Liars and The Walking Dead following. Grey’s featured fourth on the list, making it a feature across all seven countries’ overall lists.